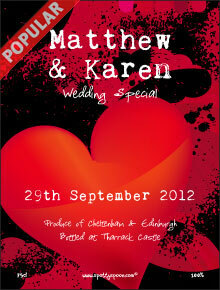 A Special Wedding Wine Label Design. 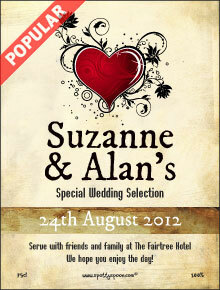 Satin hearts interlinked with love - for Marriages made in Heaven. 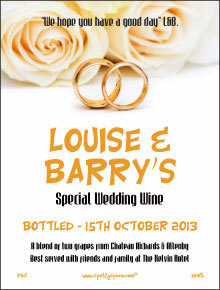 A charming wine label idea for weddings, as a gift or for the table wines. 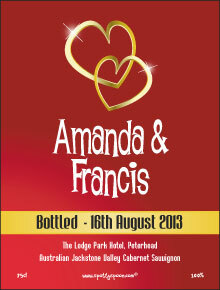 This romantic label will transform a normal bottle of wine into something special for the big day. It's distinctly sentimental image of two overlapping hearts of silk will print perfectly to turn a cheap and cheerful wine into something much more memorable. Fun phrases to add are 'A soppy blend of two mushy grape varieties', 'The End of Courtship Classic', 'It's an emotional journey full of surprises' etc. Also, see our Wording Ideas page for some text suggestions.